We’ve done a massive amount of work on the roof of our 1866(ish) commercial building on the square. It’s been an ongoing project…first addressing critical problems and now, finalizing the work so it will last, trouble free, for a long time. 1) Repair deficiencies in the deck. 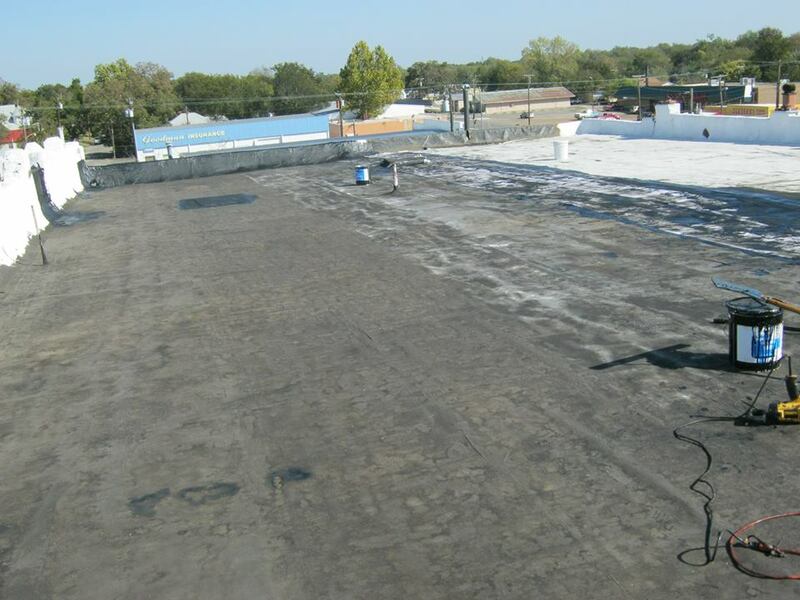 2) Coat with a solvent-based fiber-tar roof-coating. 2) While still wet, embed a special rip-stop woven heavy Polyester fabric in the wet tar. 4) Coat and fabric the edges (up the wall) to prevent tears/leaks along the edge. 5) Identify and fair any low spots (where water will stand for more than 12 hours…there are a couple). 6) After some curing time for the solvent/tar based coating, coat the entire thing with a reflective coating. The fabric is permeable…allowing the upper and lower coats to meld into one layer. The fabric acts like re-bar would in concrete…allowing some expansion, impact, etc while preventing cracking of the waterproof coatings. It is extraordinarily tough, and made just for this purpose. We are at the “tinker about the edges” stage…but this roof doesn’t leak! THAT alone is an accomplishment on a Civil War era building! This has been a job, but I’m really happy with how it’s working out. Now…if I could just get the roof project going on the Old Vic herself!